This year marks the 50th anniversary of the launch of Mr. Rogers' Neighborhood on PBS, and that landmark—accompanied by a Sundance-premiere documentary about Fred Rogers—has the children's television pioneer back in the popular consciousness. But despite Rogers' passing in 2003, his legacy is ongoing, and not just in the generations of kids who grew up on his affirming messages. In 2012, PBS Kids launched Daniel Tiger's Neighborhood, a series for pre-schoolers featuring an animated version of the gentle feline who was one of Rogers' puppet alter-egos in the original Land of Make-Believe. 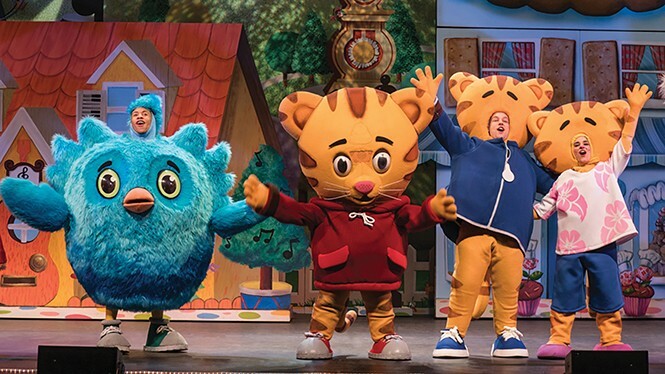 Familiar characters like Henrietta Pussycat, King Friday and X the Owl are represented by their offspring in a show that continues Rogers' focus on recognizing that everyone, even young children, deal with difficult emotional situations. JC Carter, director of Utah Repertory Theatre's Utah-premiere production of Straight, talks about the fluid sexuality of the play's protagonist, Ben, with a favorite line from the show. "He says, 'When a guy does something with another guy, he automatically becomes gay, with everything attached, no going back,'" Carter says. "He doesn't want to be just 'gay Ben.'" The play explores the life of Ben, a 26-year-old investment banker who is romantically involved with a woman named Emily ... and also romantically involved with a man named Chris. It plays around with the idea of open-mindedness among millennials, who still often find the "B" in "LGBTQ" hard to process. "The way these relationships are portrayed—between Ben and Emily, and Ben and Chris—is identical," Carter says, "so much so that it even made liberal old me rethink my concepts of sexual attraction." Not everyone can claim the luck of the Irish, and some still search for that elusive pot of gold at the end of the rainbow. However, until one reaps those rewards, why not enjoy traditional Irish entertainment, and kick up your heels to make merry? Or better yet, avoid injury and let trained professionals do the leaping. Indeed, the Trinity Irish Dance Co. tends to please those who claim a wee bit of the Irish, whether through desire or descent. Think high-kicking dancers with lightning-fast feet. The creative input of Emmy Award-winning Hollywood dance coach, former champion step dancer and company founder Mark Howard inspires performances that are both innovative and exhilarating. Little wonder, then, that they've performed before sell-out crowds in Europe, Asia and North America, showing off their skills before presidents, royalty and enthusiasts alike. "Trinity Irish Dance Co. has everything we wanted for a performance celebrating Irish heritage," says Teri Orr, executive director of the Park City Institute, presenter of the group's performance. "Their style fuses traditional elements with Howard's innovative choreography, pushing the boundaries of what seems possible." These dazzling dancers arrive a week before St. Paddy's Day with a show that will likely bring more satisfaction than a keg of green beer. Likewise, Trinity Irish Dance suggest another shade of green—specifically, that which springs from envy. "These dancers are acrobatic," Orr adds. "Their performances are charged with high-flying energy." When life gives you lemons, so the saying goes, make lemonade. When life gave stand-up comic and writer Maria Bamford lemons, the pug lovin' Minnesotan created her own surreal, confessional comedy style as a cathartic release. Her authentic approach includes finding the hilarity of county-issued hospital socks, as she mentions in the Comedy Central 2016 spotlight This is Not Happening, while her recently concluded Netflix series Lady Dynamite originates from her struggles with anxiety, depression and being a newlywed at the age of 43. Named 2014 Best Club Comic by American Comedy Awards, Bamford shed some light on the inside of her brain in an interview on The Late Show with Stephen Colbert. "It is a type of OCD ..." she says. "If you have unwanted violent or sexual thoughts—for example, if you were concerned about, let's just say, chopping up your parents into chunks and bits and putting those bits on a Cobb salad—you might want to talk to somebody."